Gillian Armstrong's portrait of costume designer Orry-Kelly is entertaining as all hell. This is one of the very very rare documentaries that you’ll end up watching over and over again simply because watching it is just a great deal of fun. Best of all not only is this a wonderful portrait of a man who dressed Hollywood but it’s also a great behind the scenes portrait of old Hollywood. Orry-Kelly was born as Orry Kelly in Kiama Australia in 1897. He caught the theatrical bug early and made his way to the United States after the First World War. Falling into a the wild theatrical life in New York he bounced from chorus to chorus. His charm had him befriending stars such as George Burns, Gracie Allen and Jack Benny. He also began a long term relationship with Archie Leach aka Cary Grant. Using his artistic training he fell into making ties and clothes as a way to pay for things between acting gigs. Once he and Archie moved to Hollywood his ability to design clothes and his ability to work with the great actresses made his career. In a day where talking heads rule documentaries and recreations are the stuff of weak TV director Armstrong makes the bold choice by having stage actor Darren Gilshenan to portray Kelly whose regaling of his life story is the spine of the film. If you imagine one of the best raconteur you can imagine holding court and you’ll have an idea about how Gilshenan holds your attention. Make no mistake possibly the biggest reason this film works as well as it does is that Gilshenan is at its center. It’s a performance so good that were it to be in a traditional drama might very well get him an Oscar nomination. It’s so good that when we finally see the real Orry at the end I was both amazed at how well Gilshenan got him, and how disappointing that Orry wasn’t like his cinematic double. Cut into the Kelly’s tale are the talking heads we have come to expect, but these talking heads are equally riveting. A sterling collection of people who knew him (Anne Roth, Angels Lansbury and others) and those who were influenced by his work are joined by Hollywood historians such as Leonard Maltin to not only fill in details that Orry leaves out but also to paint a wonderful portrait of New York in the 20’s and Hollywood in it’s Golden Age. They give us a wonderful look inside the studio system and how it handled celebrities, especially gay ones. They give us context to what Orry was experiencing and reveal how he influenced other people. One of the many things that I love about the film is that I got to meet, granted just cinematically, Orrey Kelly. What a character he is. I love that he always was what he was regardless of where he was. He was a gay man in an industry that was notoriously homophobic. If you want to know just how good this film is consider that I didn’t want to see this film. 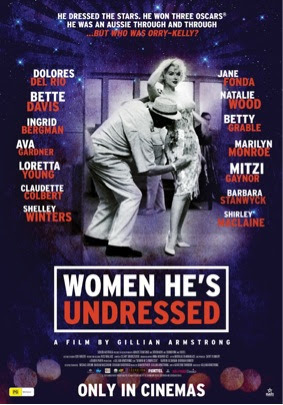 I had no intention of taking the time to see this film but while I was talking to the PR person for this film about another film he mentioned that he as handling THE WOMEN HE’S UNDRESSED and he slipped me ticket to the film. Like an experienced pusher we talked me into seeing the film. And I’m glad he did, this is one of my favorite films on Hollywood from the past few years. It is also does what the truly great documentaries do and that is be about more than it’s subject. Here is a film that is not just about Orrey-Kelly, or costume design or Golden Age Hollywood, or being gay. Yes its all of that but it’s also a wonderful expression of why we should be ourselves. Granted not all of us are going to be as charming as Orrey-Kelly but maybe if we are ourselves perhaps we can make a run at winning three Oscars and altering how society dresses.